Safer* Paint & Varnish Remover soaks into and softens gloss, emulsion, vinyl silk, interior textured, Hammerite, chlorinated rubber paints, modern water based and old spirit based varnishes. This allows easy removal from the substrate. 1. Stir well before use. 2. Protect all areas not to be stripped. 3. Pour product into any suitable container. 4. Apply a generous coat by brush. DO NOT BRUSH OUT. Wait about 30-40 minutes. (40-50 minutes for textured paint.) DO NOT ALLOW TO DRY OUT. 5. 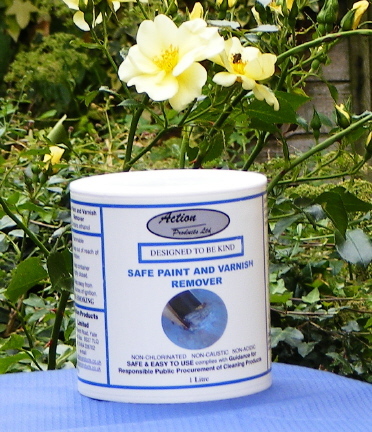 Check a small area with a scraper to ensure that Safer* Paint and Varnish Remover has fully penetrated into the paint. If not, wait and check again. Remove softened paint. 6. If any paint remains - repeat the above process. 7. Wash area with water. Ensure no trace of remover remains. Allow to dry before redecorating. 8. Wash hands after use. 1 litre covers from 2-4 square metres. 5 litres covers from 10-20 square meters. 25 litres covers up to 100 square metres. Protect eyes when working overhead. Wear impervious gloves to remove softened paint. Prolonged contact will dissolve polystyrene and damage Perspex. Prolonged contact will dissolve nail polish and acrylic false nails. Whilst Action Products Limited has taken every care to ensure accuracy of the data contained in this document; no guarantee or liability will be assumed. It is recommended that customers satisfy themselves of the suitability of all product purchased for their own use. Keep container securely closed. Store out of direct sunlight. Protect from frost. If paint removed contained lead, then the waste material will contain lead. Hammerite is a trademark of ICI Paints Ltd.
All chemicals and chemical compounds used by Action Products conform to European guidance to the Public Sector on procuring green products and services. The word Safe has been changed to Safer*. All products are SAFER* than products based on highly flammable methylal or toxic methanol. This change is to comply with European Advertising regulation requirements. Our products remain the same fast acting, non-toxic, low odour products which have been enjoyed by our customers since 1998. Thank you for your continued custom and support.